Just as the internet’s fixation with Jared Leto’s dramatic haircut died down, another Leto-related hair ‘event’ hit the web. 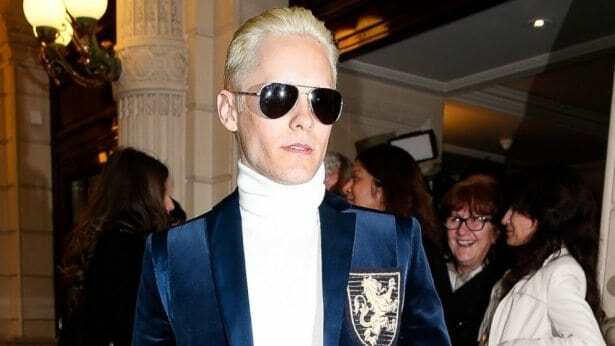 “DROP EVERYTHING: Jared Leto is platinum blonde,” reported the Huffington Post. “It’s been just days since the world mourned the loss of Leto’s beloved man bun. Now, the handsome actor is pretty much unrecognizable with his new platinum, shaved ‘do,” HuffPo ranted. “It’s been a long, emotional roller coaster of a week for fans of Leto’s once-gloriously long locks,” The Hollywood Reporter chimed in. While this does seem like the mainstream entertainment media’s typical (over) reaction to celebrity looks and antics is we here at 18|8 aren’t super surprised at the Leto-goes-platinum reaction. In fact, Jared Leto attending fashion shows in Paris earlier this month with his bright new bleached hair outshone even the attention-grabbing wife of Kanye West, who appeared on the same day in Paris sporting an almost identical shade of platinum blonde. So why the big deal about Leto’s newly peroxided locks? Because for many guys, drastically changing the color of their hair is a big deal. Women play with colors way more frequently — switching from blonde to brunette or redhead to raven-haired on a whim. But men traditionally dye their hair in significantly lower numbers than women. Thankfully these days, guys are increasingly mixing it up with color — and many are getting more adventurous than merely the lower-commitment color options such as highlights, lowlights or gray blending (when that time comes). Of course, going a pale platinum blonde like Jared Leto has done recently is undeniably a pretty serious undertaking. Depending on the base color of your hair, it often requires more than one color process. So here are some tips and things to consider for guys contemplating going platinum. No matter what your natural hair color is — really anyone can go platinum. It just depends on what tone you want as the end result. For instance, if you want your hair to have a silvery tone, make sure your skin tone works well with ashy colors. If you want a more yellowish platinum blonde, make sure your complexion looks good with warmer shades. Going platinum involves a double process coloring technique, which entails a whole lot of stripping of your hair color. Make sure your roots are the last thing that your colorist touches to avoid breakage at the root. Don’t wash your hair for 24-48 hours after you have it colored. This will help not only to maintain the tone, but will help keep it from drying out too much. To prevent breakage, use a hair mask once a week and use hair oils daily or as necessary to keep the hair supple, shiny and healthy. To maintain the color and avoid brassiness, use a color shampoo especially developed for platinum hair — such as a violet/silver shampoo about once a week. Products such as this will also help to reduce or minimize any fading.